The sweep targeted four locations of interest within Costa Mesa and resulted in the arrest of four subjects including Angel Estrada, 25, Lake Forest, Bryant Islas, 35, Santa Ana, and Binh Giang, 31, Westminster, for being in violation of their parole. 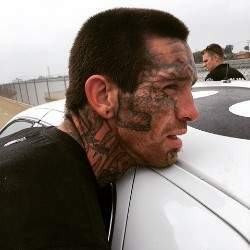 The fourth arrestee, pictured above, Charles Oswald, 35, Costa Mesa, initially fled on foot into Talbert Park, where he was apprehended by investigators and arrested on an active felony warrant and evading a peace officer. All four arrestees were booked at CMPD Jail before being transported to and booked into OC Jail on no-bail holds.